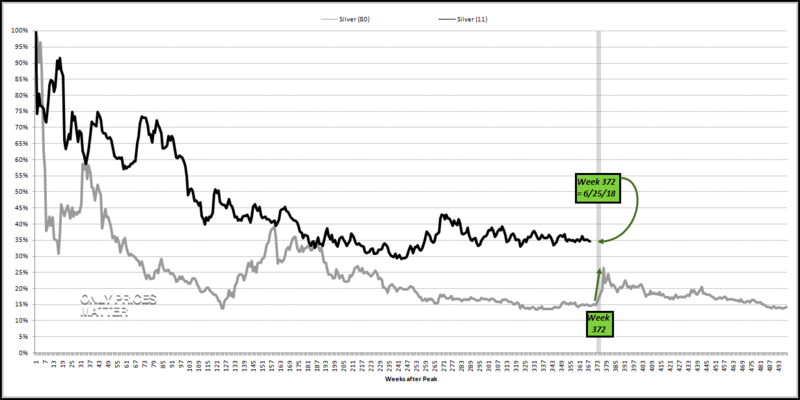 I’ve recently written extensively about why I believe silver is poised for a window of out-sized upside this year, if even it comes in a brief window of time like 1987’s 65% rally, which occurred in two months. This thesis is largely driven by an analysis of how other bubbles have traded off their peak bubble prices across history, which suggests that on average, at the +seven year mark off such a high various other assets have inflected higher for large retracement rallies. 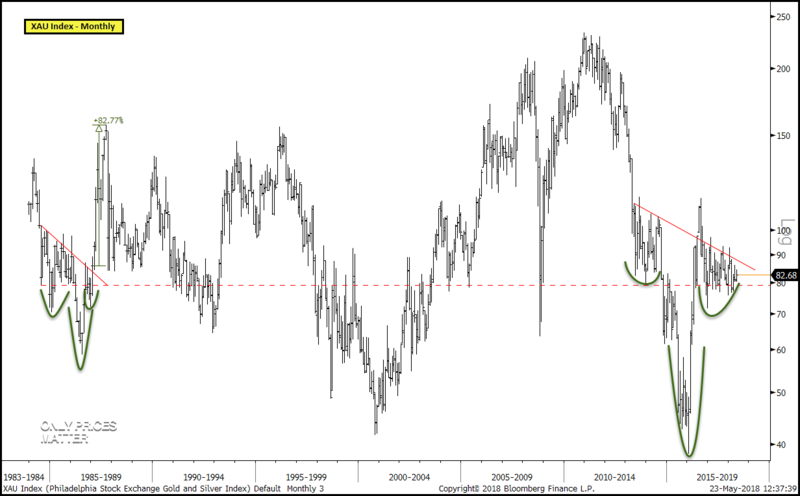 Specifically, I’ve called out two historical precedents that appear to offer excellent road-mapping analogs for silver today: i) the aforementioned 1987, 65% rally in silver which occurred seven years off its 1980 high and ii) the 2H14 rally that began in the SHCOMP that began seven years off its 2007 high and led to a 2x rally in less than a year. Today we step away from these precedents’ big-picture guidance and drill into their tactical set-ups prior to breaking out for their rallies to see if we can leverage any insights that might aid us in more precisely timing a coming break-out in silver and thus, refining our position building as this move unfolds for maximum risk/reward benefit to our P&L. If we drill into the two-month, 65% rally in 1987, we find that it began 372 weeks off the Jan-80 weekly closing high. Silver is currently 365 weeks off its Apr-11 weekly closing high, implying five additional weeks of consolidation before a break-out in the week of 6/25/18. Outside of the analog timing above, look at how similar the approach into the 1987 pivot compares to the approach into what is ostensibly the 2018 pivot. If we shift our attention to the SHCOMP we find the approach it took in the year prior to its mid-14 break-out and pivot is also highly similar to the approach silver has taken over the past year. Not only does price structure appear similar, the actual dates off the various ebbs and flows on a calendar basis have lined up incredibly well too. 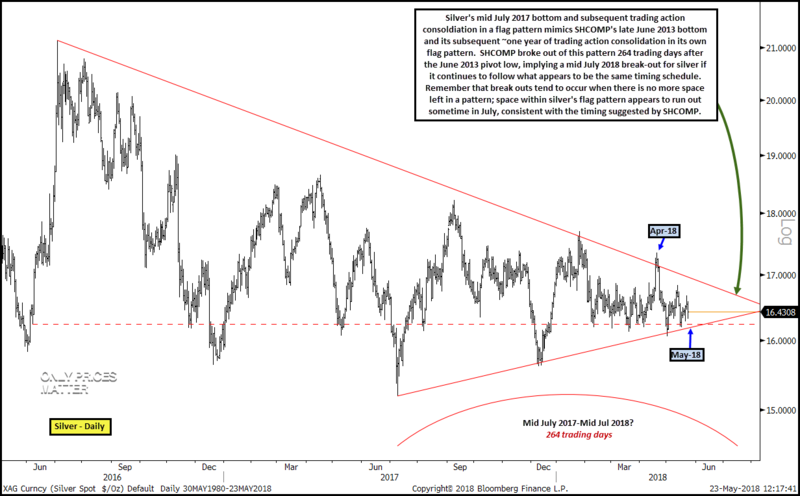 If the timing on silver remains consistent with the timing suggested by SHCOMP in 203-2014, it suggests a potential break-out 264 trading days after silver’s Jul-17 pivot low, or sometime in mid Jul-18. Being mindful of the fact that break-outs from patterns tend to occur when there’s simply no space left in the pattern for price to consolidate, silver’s current flag pattern appears to run out of its own space in Jul-18, consistent with the timing suggested by the SHCOMP. If we draw up an analog with our anchor point at the SHCOMP’s mid Jun-13 low and silver’s mid Jul-17 low, we get the following. Very similar across the ensuing year and entering the period where downside risk should be fairly minimal (a few %) and we begin to target a break-out. However, one caveat is that the SHCOMP was putting in higher lows as it entered the final stage of its consolidation move whereas silver has recently put in lower lows. This is worth keeping an eye on. And before I forget, I’d be remiss not to mention that the Nikkei had a technical flag/consolidation pattern into its mid Dec-12 break-out that was similar to the SHCOMP pattern that followed in 2013-2014 and silver today; in effect, all three were coiled up into that tight flag. Amazingly, it took the Nikkei 264 trading days (!) 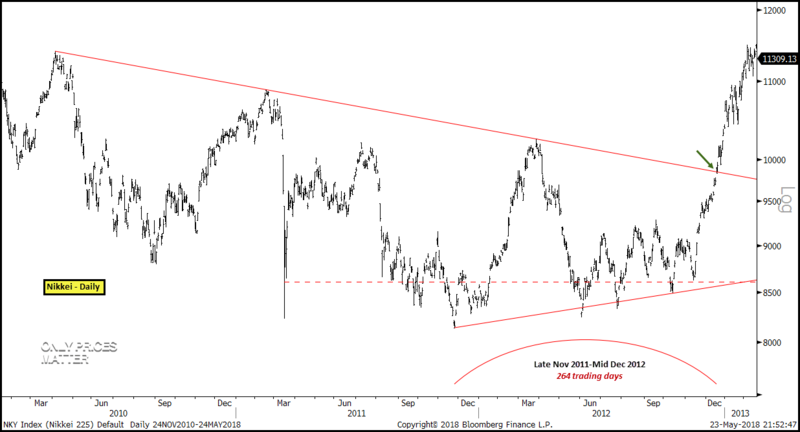 from its late Nov-11 pivot low until it broke out in mid Dec-12 for what turned into a 2x move on the index in < a year. Yes, 264 trading days, as in the same exact # that it took the SHCOMP from its Jun-12 pivot low into its Jul-13 flag break-out. Crazy. 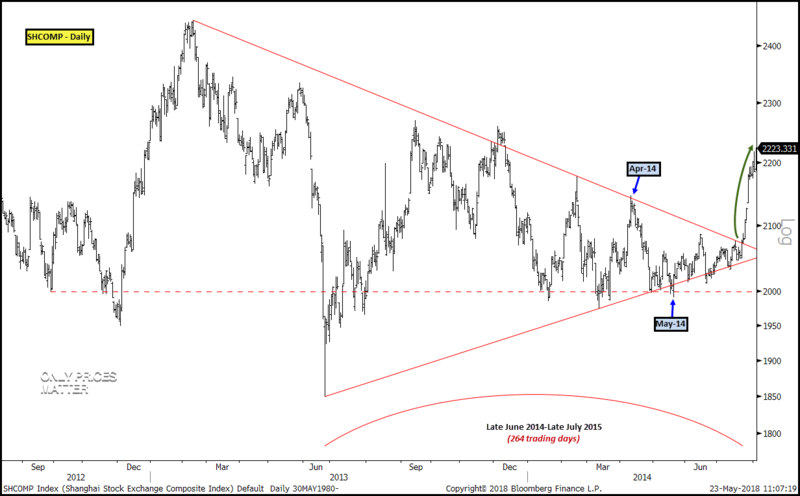 Thus, we have one approach that suggests a silver break-out in the final week of June and another – based on two equity index precedents – suggesting 264 trading days, or mid July. If silver can continue to hold the support from its flag pattern and generally grind a touch higher as we move through June, I would likely be inclined to add to my existing position. A failure to properly size up upon break-out could cost us significantly in opportunity cost because silver’s historical propensity has been to make large moves very fast; thus, we might not have the luxury that the SHCOMP gave us by rallying for an entire year after breaking out before peaking. Upon any break-out from the flag I believe one could trade the metal very aggressively on the long side, as well as its miner derivatives. 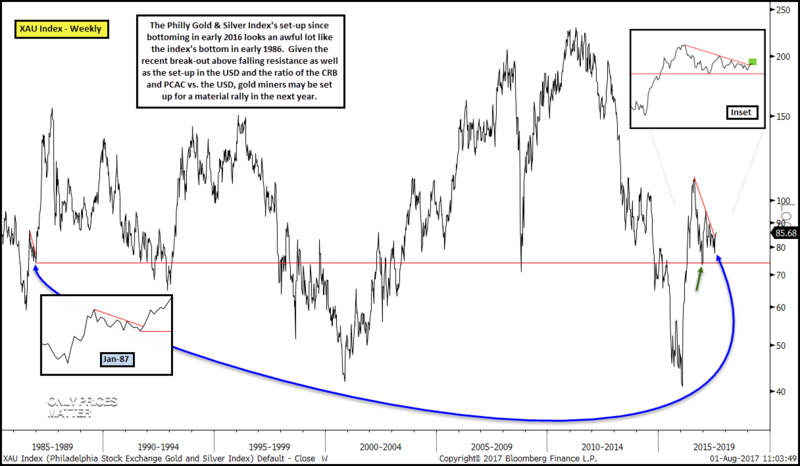 As it is, any break-out in silver likely coincides with a similar move in the XAU Index, something we’ve been waiting for that I highlighted some time ago in this post and itself stuck in a set-up highly emblematic of 1987 too.